Find out how technologies are transforming transportation in Alberta. Technology is changing how we travel. Developments such as electric vehicles, connected cars and drones provide new ways to explore the province. Timelines for introducing most of these technologies into our daily lives are constantly changing. The Government of Alberta is monitoring them closely and continually preparing for changes and possible impacts to Alberta's transportation network. These systems involve vehicles, drivers, passengers, road operators and managers, all interacting with each other and the environment, and linking with infrastructure systems to improve the safety, competitiveness and capacity of our highway network. The Smart Roadside Inspection System at the Leduc Vehicle Inspection Station. 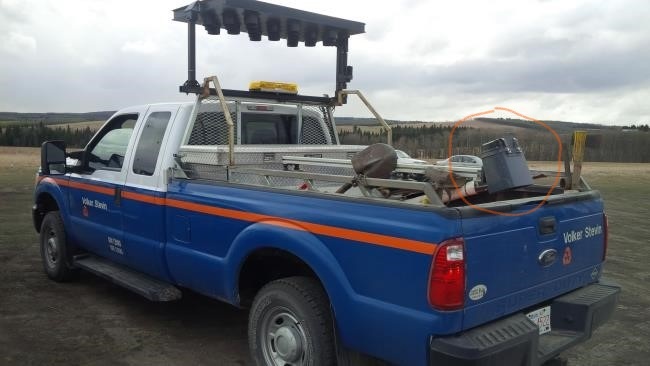 Alberta's Smart Roadside Inspection System (SRIS) is an electronic management and enforcement system that automatically identifies high-risk and problematic commercial vehicles from the side of the road, without interfering with traffic flow. Using multiple sensors, cameras and business-rule based screening, SRIS provides Alberta's Commercial Vehicle Enforcement Branch with tools to focus more effectively on commercial vehicles that pose the most risk to transportation safety. SRIS provides important information on commercial vehicles passing through vehicle inspection stations and allows Commercial Vehicle Enforcement Peace Officers to take further action, if needed. 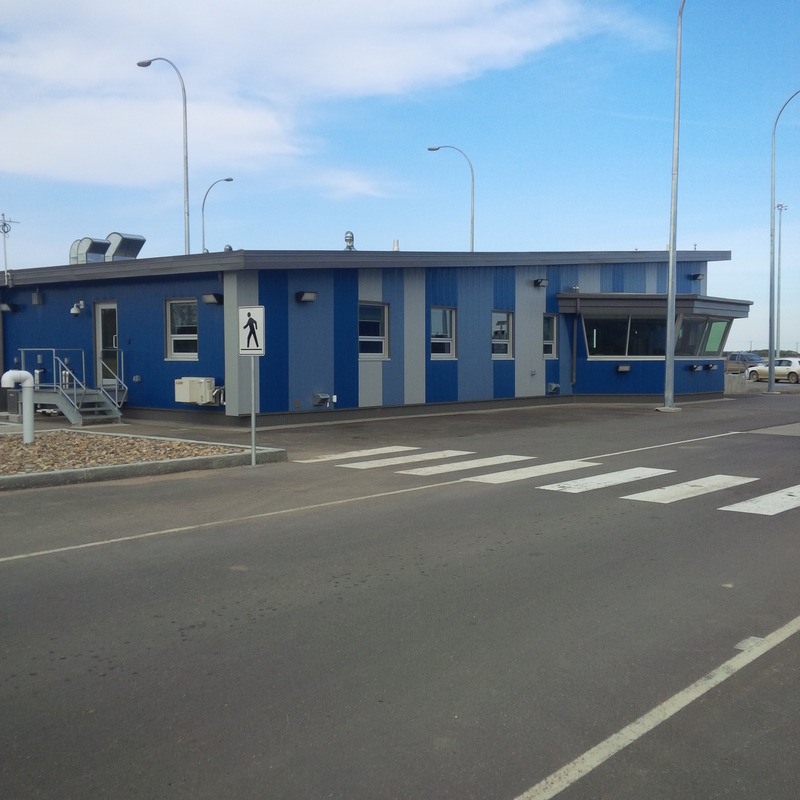 The first fully operational SRIS was installed at Leduc Vehicle Inspection Station in 2012. This strategic approach to safety was undertaken to reduce serious injuries and fatalities involving commercial vehicles. Learn more about Alberta's commercial vehicle inspection stations. Example of an Road Weather Information System (RWIS) tower. Alberta is one of Canada's leaders in the use of the RWIS. Since 2005, more than 100 RWIS stations have been installed on the provincial highway network and that number continues to grow. These stations house sensors and cameras that track and gather road and weather conditions information in real-time reports to generate current conditions and forecasts. 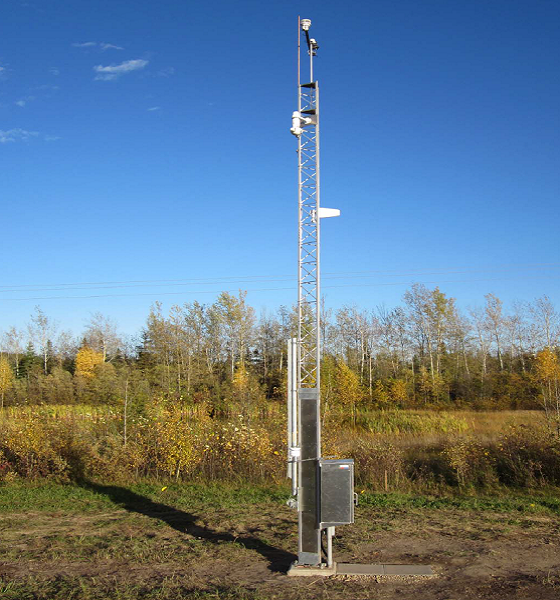 A Mobile Road Weather Inspection System and its downward-facing sensor. Alberta Transportation has deployed 20 mobile versions of RWIS to record road conditions. Mobile RWIS technology provides improved situational awareness and decision support for road maintenance operations. It also provides more geographically-specific observations for locations between RWIS stations, at a lower cost. Alberta Transportation is exploring how Mobile RWIS could be integrated into 511 Alberta for real-time, enhanced situation awareness of road conditions. MDSS is a relatively new technology that works with the RWIS system to recommend road maintenance treatments in winter. Its knowledge base incorporates road treatment plans from all highway maintenance contractors. MDSS road treatment plans are dynamically matched with weather and road condition forecasts generated by the RWIS system. This information is used to recommend snow plowing action, chemical type and application rate for expected weather and road conditions. The Alberta MDSS was the first system in Canada to be implemented province-wide. Several emerging technologies have the potential to change transportation systems around the world. Although these technologies remain unproven, they are gaining momentum and interest, and government is tracking their progress. Highly automated vehicles, commonly known as self-driving or autonomous vehicles, operate without the driver needing to control functions such as steering, acceleration and brakes. This technology is intended to improve traffic and driver safety and convenience. So far, several self-driving vehicle trials have taken place in Edmonton, Calgary and Wetaskiwin. The trials have included the use of a self-driving shuttle guided by 3D sensors, high-accuracy GPS and cameras to guide its movements. This form of transportation continues to be explored to ensure safety and privacy considerations are addressed. All work together to make transportation safer, more efficient and secure. A connected vehicle ecosystem is emerging in which connected vehicles would communicate critical information in real-time with other vehicles and surrounding roadside infrastructure, such as traffic lights and electronic signs. Connected vehicles could receive warnings about hazards, such as pedestrian alerts, icy roads, vehicles following too closely or traffic congestion. Remotely piloted aircrafts, commonly referred to as drones, are power-driven aircraft that fly without a human operator onboard. New federal regulations for drones come into force on June 1, 2019 and apply only to drones between 250 grams and 25 kilograms, whether they are for recreational or commercial use. Learn more about the ACTIVE-AURORA project. Learn more about the MATI awards program, including how to enter.